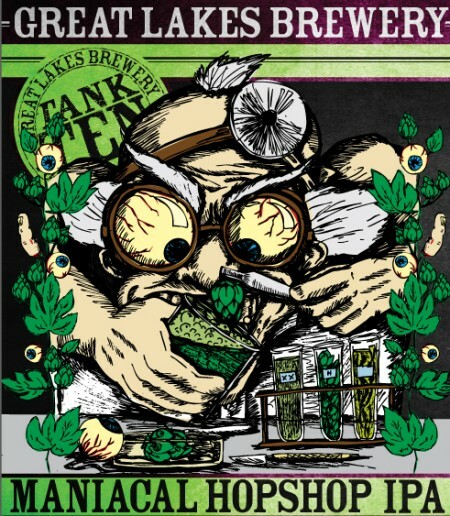 TORONTO, ON – Great Lakes Brewery has announced details of a new beer that is set to be released later this month. This brand spanking new unfiltered IPA pours a burnt gold that wears it’s white cap brilliantly. When you get your nose into the glass in front of you, notes of zested lemon, fresh papaya, and some lighter notes of elderberries hit you in the face, then the pine comes along and takes over. The body is medium to medium light with a soft carbonation that allows the flavours of the Equinox hop to shine through. Tropical fruits (papaya, kiwi) and lots of resiny goodness. Sweet up front, then juicy, leading to a pleasant bitterness and a very dry finish. Maniacal Hopshop will be available later in October in a limited run of 473 ml cans exclusively at the Great Lakes retail store.